If you want to keep the inside of your car smelling awesome, don't buy commercial air fresheners. They contain toxic synthetic chemicals which can be harmful to your health. Using recycled cardboard, fabric, a piece of string, a hole puncher, and some natural essential oils, you can make your own DIY, non-toxic air freshener that will keep your car smelling minty fresh while not doing a number on your long-term physical health. 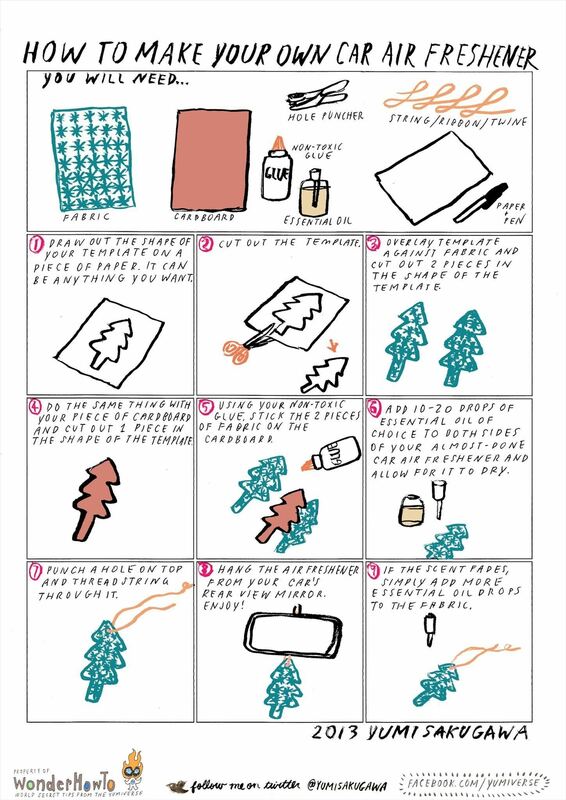 Simply draw out an outline of what you want your air freshener to look like on a piece of paper. It can be a tree, the border of your favorite state, an animal, or whatever you wish. Cut out the outline and use it as a template to cut out two pieces of fabric and one piece of cardboard on that shape. Stick the fabric pieces on both sides of the cardboard shape and add 10 to 20 drops of your favorite essential oil on both sides of the fabric. Let dry, punch a hole on top, thread string or ribbon through the hole, and hang on your car's rearview window. Enjoy the fresh, natural smell, and when the scent starts to fade, simply add more drops of essential oil to the fabric.